Radio detection and ranging (radar) is viewed by most as one of the quintessential technological accomplishments of the Twentieth Century. Radio detection finding or RAD, as it was known in Great Britain, was perhaps the single biggest piece of technology, aside the atom bomb, that came out of the ashes of World War II. The employment of RAD made the defense of Britain more plausible to plan for. The Royal Air Force (RAF) enjoyed a major technological advantage during the Battle of Britain because most of the times they knew where was headed the bulk of the Luftwaffe force. It could be argue that without radar, the fierce battle that ranged over the skies above the British country side would had been lost. Radar also warned the Americans at Pearl Harbor of a massive airborne formation heading towards them. Unfortunately for the United States forces at Hawaii, misinterpretation of the radar data lead to the surprise of the attack. Radar was used extensively by the Americans in their Pacific and Atlantic campaigns. Today, many facts about the development of radar is widely known. What is seldom mentioned by historians and researchers alike is the fact that in the beginning, it was Nazi Germany, not Britain, which was leading the way in the field of radio detection. On a the clear morning of September 26th 1935, a group of high German naval officers, including the overall commander of the German Fleet, Admiral Erich Raeder and various Nazi party leaders; visited the new Funkmessgerat station (radar finder device) at Pelzerhaken near Neustadt in the Bay of Lubeck. At top of the forty feet tower, the visitors, for the first time, were able to see in action Germany’s new technological marvel: the radar. The rudimentary equipment, which included sets of transmitters, receivers, turntables, monochrome screens and two electrical generators; was designed to located a ship up to a distance of five nautical miles outside the field of view, quiet an accomplishment for the day. As it was setup, the transmitter would send out a radio pulse signal to all directions which would proceed to bounce off the searched platform and return to the receiver. Then the receiver would send a signal to the monochrome display projecting a one dimensional image revealing the platform’s present. To the stunned VIP audience, the demonstration was an eye opener. But to those who knew radio technology it was but just one step towards a bigger goal. Almost a year early, American inventor Robert Morris Page had demonstrated the feasibility of a radar system with his December 1934 experiment near Washington DC. Three months later, Robert Watson Watts, known to many as the father of the radar; made his first active experiment. From there, radar was well on its way. The first German active radar experiment took place on March 1935. A rudimentary set of transmitters and receivers were able to pickup a faint signal bouncing from a German warship one mile away. Similar efforts were also taking place in France, Italy, the USSR and, on a somewhat more limited scope, in Japan. The system demonstrated at Pelzerhaken on September 26th was the direct result of the research done by the brilliant German physicist, Rudolf Kuhnold. In the mid 1930s Kuhnold was the owner of a small new corporation named Gesellschaft fur Elektroakustische and Mechanische Apparate (GEMA) which specialized in the development of sophisticated transmitters and receivers mechanisms. GEMA had close ties with Germany’s Naval Research Institute. From the mid 1935 onward, GEMA, although not officially linked to Germany’s military industrial complex, was an integrated part of the Fatherland’s war effort. Before the war ended, the small 1935 company would had grown in size and scope. By early 1945, GEMA employed more than 6,000 skill workers, a far cry from the days of a seven staff operation. But although GEMA began the radar revolution, it had by no means a monopoly on the new technology. Within three years, Siemens, Telefunken and Lorenz would push their own radar system programs. Beside the enormous potential the Pelzerhaken experiment showed, it also seeded a deep distrust between the Navy and the most powerful Luftwaffe. Because the experiment was first showed to the top brass of the navy, many of them resentful of the treatment they had been receiving from the Luftwaffe leadership, wanted it to keep the news of the system in the dark. No radar story could be develop without mentioned the extraordinary efforts of one man, British physicist Robert Watson Watt. At forty two, Watson Watt, the head of Britain’s National Physicist Laboratory’s Radio Research Station, was summoned in 1934 by the Air Ministry to explore the possibility of developing a transmitting, damaging radiation platform to be employed against possible enemy air incursions, mainly from Germany. He began his research in earnest focusing on utilizing radio signals for early detection of incoming objects. On February 26th 1935, Watson Watt and his trusted fiend and colleague, AP Rowe, turned on the world’s first true radar mechanism at the British Broadcasting Company’s short wave radio station in Daventry, Northamptonshire, almost seven months ahead of the Germans. Watson Watt’s system operated at a 164′ wavelength spectrum. It employed a basic receiver set that gather signals generated from a high frequency alternating current (the number of cycles per second is known as frequency). Radio emissions or waves are electromagnetic radiation similar to light waves, but they have a longer wavelength range. When utilizing radio signals for detection of objects, a beam is emitted, the waves scatter all over the “target” to later return as an echo which the receiver picks up at the point of origin. Radio wavelength are, by definition, large, and those utilized by radio transmitters are measured in feet or meters. A smaller wavelength is require in order to make a much accurate profile of the targeting object. This was the first problem encounter by Watson Watt and the others radar pioneers of the times. The generation of wavelengths less than a feet, also known as microwaves, required massive amounts of raw energy in order to travel long distances. Any mechanism capable of generating such a force was bound to be big. Then the process would be complicated. The mechanism needed to be reduced to its smallish form in order to be fitted on an aircraft’s bay. On Watson’s experiment at Daventry, a heavy bomber flew over the BBC’s radio towers and on the second pass, radar operators saw “beats” on their monochrome displays screens for just over two minutes. They were able to track the bomber flying pattern for up to eight miles. Although early successes on both sides of the Channel were promising, they by no means were error-free. Mistakes in developing the new technology was a common trend on both, Germany and England. In Germany, the most costly error made was ceasing research into the development of an magnetron, which German physicists tested and later on, discarded for obscure reasons. A fact attributed to the rigid Nazi political system. In February 1953, while giving a lecture on the birth of radar, Watson Watts stated that “I believe that British and American success in radar depended fundamentally on the informed academic freedom which was accorded, in peacetime radio research, to my colleagues and myself…I believe the most valuable lesson from radar history is that of the intellectual organizational environment from, and in, which it grew”. Renowned German historian, Harry von Kroge disagree “The aspect of the German effort that seems to have differed from the Allied was the degree to which corporate rivalry affected the course events. The numerous agreements that had to be made concerning licensing and post-war rights I order to smooth production will certainly seem remarkable to American and British readers”, he went on to said that “a puzzling aspect of German radar research was the delay imposed by severe secrecy in drawing on the many excellent universities and polytechnic institutes until late in the war”. His claim was that the British and, to a lesser extend, the American radar effort ran more smoothly because its was under the auspices of the military with full access to all of the academic and civilian sources of expertise. His claim has some merit. Germany’s first radar array was sorely developed by a private company with the encouragement of a major naval research institution. This contrasted with Germany’s other top scientific programs such as missile development. Engineers assigned to rocket and propulsion development usually drew freely on the expertise of others, specially on the universities ranks, to achieve their goals. Again, there’s evidence to support the theory. Its true that the British main radar problem, the development of a workable and reduce microwave-based system was enormously enhanced by the program’s ability to recruit the best talent from any source. This, pluralistic effort will eventually find its way to a central research program and thence to full production. In Germany on the other hand, there were not enough collaborative diversity, instead, a series of modern era monopolies worked under the cover of secrecy, not for military purposes but to protect their intellectual rights. This problem was compounded by Germany’s leaders preferences for offensive weapon systems instead of purely defensive ones such as a radar array. This one set mind would have a devastating effect on the overall German war effort. But what is more puzzling about the whole program was the lack of understanding of what a radar system could achieve by the very top political and military leadership. A clear example of this was the Luftwaffe’s technology chief, General Ernst Udet, who objected from the very beginning the massive amounts of money the radar program were being allocated on the bases that if it works “flying won’t be fun anymore”. Despite all those factors, Germany could had matched or even surpassed Britain’s radar program if its was not for Watson’s obsessive determination. The prominent scientific historian David Zimmerman put it simple, “Much of the rapid early progress in the early years was a direct result of the drive, energy and leadership of Watson Watt”, but “paradoxically, it would be Watson’s erratic, almost manic behavior and lack of administrative skills which would be a significant factor in the failure to mount effective night defenses ready in time for the Blitz”. When Adolf Hitler plunged Germany into the Second Word War he envisioned a short raging contest. Never in his dream had he envisioned a prolonged and straining four year struggle, but by 1942 he was exactly in the middle of his “struggle”. In order to chance the tide of the war, the German leader ordered the design and development of very advance weapon systems. By this time, many civilian initiated, dual-purposes projects were underway in Germany. Chief among them were the V (for Vengeance) weapons platforms. The first of those systems, the V-1 or “Buzz Bomb” was able to bring terror into the heart of London. 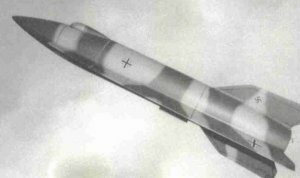 The V-1, which was essentially the first rudimentary cruise missile, was easy to design and built in large quantities. Next in line came the famous V-2 rocket. There were several variants of this impressive missile system. The more impressive one was the forth generation variant known simply as the A4 rocket. The A4 was the first truly military-controlled missile developed system. In short, the A4 was the world’s first ballistic missile. It was 46′-0″ en length with a circular diameter of 5′-5″. On the base of the rocket, four fins, with a span of 11′-8″ gave stability to the platform. Prior to fueling, the A4 weight it at 8818 lbs. The A4 was able to carry an impressive 1654 lbs warhead. Fully loaded, the rocket weight it at 28440 lbs. The fuel use to power this massive rocket was a combination of alcohol and liquid oxygen that consume itself at a rate of 280 pound per second. This rate of consumption gave the A4 only 65 seconds of power flight. But by the time its fuel had ran out, the A4 was traveling faster than the speed of sound. Operational range for this rocket was an astonishing 220 miles. The first A4 was launched on the morning of June 13th 1942 from test Stand Number 7 at Germany’s main rocket research facility on Peenemunde. The launch, which was viewed by the Luftwaffe top brass, was successfully. The rocket cleared the launching tower without any problems. If the liftoff was successful, the flight trajectory was not. After reaching the dense cloud formation above the Baltic coast, the rocket exploded in an impressive manner. Nevertheless, the test had proven the feasibility of the A4’s design. Further test were made and, on the afternoon of October 3rd 1942, the A4 made its first successfully launch and flight. The rocket achieved an altitude of nearly 50 miles above Earth and landed more than 120 miles outside the Test Stand area. After less than ten test sets, the A4 was deemed operational by the Nazis and on September 6th 1944, two of these extraordinary rockets were fired at Paris. Within a matter of days, A4s were been fired at London and the important Belgian port city of Antwerp. It is believed that in the later stages of the war, Germany developed over 5,000 V2-class weapons, firing above 1,000 of them towards the English capital. As a weapon of terror, the A4 had its use, but it was far too rudimentary to affect positions on the strategic battlefield. A new kind of missiles was needed. Range and payload became Germany’s obsession when it came to its rocket program. Thus the development of Germany’s next ballistic rocket was centered on those two factors. The new A9 missile was basically a winged version of the current A4 platform. Engineers at Peenemunde found that once a rocket reached its top altitude and exhausted its fuel, it will plummet toward the ground with out many in-flight corrections. But, adding wings to a streamline body will enable the A9 to “glide” to its intended target area. Beside a flight pattern correction, the installation of wings on the bottoms of the missile will give the rocket a much better opportunity to explode above its target instead plummeting hard to the ground as the A4 did. When a missile hit hard the ground, the proceeding explosion is mostly absorbed by it. If the missile could glide to its target instead of plummeting on it, it would hit it more softly causing a bigger explosion effect. When conceived, the A9 blue prints closely resemble that of the A4. It had basically the same frame length and diameter dimensions. The idea of adding the wings, first proposed by designer Kurt Patt during the A4 program; was first viewed as too radical for the A9’s engineers, but as the program progressed, those wing structures were viewed as stabilizing and controlling mechanism. Beside the controlling aspects of the wings, designers estimated that these structures could actually double the rocket’s operational range. As promising as the A9 program was, it was not one of Germany’s top projects until the Allied landings on Normandy. With the Allied armies in northern Europe, London was now out of the A4 range. Thus on the summer of 1944, the German High Command ordered the A9 to full production status despite the fact that the rocket’s new engine system was not fully tested. Clinging to the faint hope of knocking the British out of the war, Hitler ordered massive A4 and 9 attacks on London and its nearby cities and towns. The decision of the Fuehrer basically ended any hope German had of developing a real Inter Continental Ballistic Missile. On July 1941, Field Marshall Walther von Brauchitsch, Germany’s Army Commander in Chief, suggested to Hitler and the Nazi top brass that the developing of a functional and advance rocket program would give a moral boots to the German people. He also, vaguely, mentioned that Germany should place resources into developing a missile capable of reaching the United States. There are some rumors that Peenemunde’s to secret Projects Office commenced designing a missile capable of achieving long distances. The project, which some had called the “American Rocket” it was rumored to had began in late 1940. The American Rocket was the brainchild of Ludwig Roth, a brilliant, yet obscure German designer; who began looking at the feasibility of installing an A9 missile on top of a massive booster rocket. The concept, now designated A10, was deemed to technically challenge by most German engineers. The A10 program was called off soon after. If developed, Roth’s massive rocket would have an engine capable of giving it almost 200 pounds of thrust for around sixty seconds this would had enable the mounting A9 rocket to reach an altitude of 35 miles. It was estimated the returning A9 could have cover a range of 2,500 miles in just thirty five minutes. After the A10 program was terminated, there were discussions of developing a manned version of the A9 system. Engineers believed that a manned rocket would have solved the main problem of guiding the rocket to its target. There were even “talk” that a manned A9 with an A10 booster can actually hit small targets such as the Empire State Building. The idea was that once the A9 was in clear sight of its target, the pilot would have bailed out and the rocket would have self-guided to the intended area. Although the project looked promising on the drawing board, it never made it out of it. In fact, all work relating to the A10 booster rocket was terminated in the spring of 1944. Work on the winged A9 proceeded at much slower peace. The A9 project was cancelled in the autumn of 1944 because of material and fuel shortages. Although halted, the A9 and A10 projects did provide Germany with the necessary data from which to further develop its operational missile, the A4. A winged version of the A4 with a new and improved propulsion system, code named A4b, was developed. Unfortunately for Germany, the Red Army was closing fast on Peenemunde and all work related to this program was hastily suspended in late 1944. If Nazi Germany would had employed the resources needed to configuration A10 booster with an A9 rocket, there is little question that Hitler would have had the world’s first true Inter Continental Ballistic Missile. The extent of German research and development of a true ICBM can better be explained by Wernher von Braun, the brilliant German scientist who led the American effort to reach the moon. When interrogated after the war, von Braun explained that German engineers were commencing the design of a new booster rocket, code named the A10, which would have been a three stage, extremely long range ballistic missile. In fact, he described the A10 as the first moon rocket, meaning that it was intended to get the A9 missile over Earth’s atmosphere. How close Nazi Germany came to actually develop a workable ICBM is anybody’s guess, but the sheer volumes of data clearly point to a massive German effort to develop such a weapon. One could guess that if Hitler and his staff had pressed the rocket program early on the war, what could that program have delivered?